Now here’s something you don’t see in a video clip every day – women wrestlers! 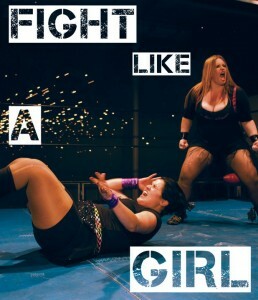 Yes, UK singer Jenna Dwyer’s new single ‘Fight Like A Girl’ is a track lifted from the soundtrack from a forthcoming wrestling zombie action flick (we kid you not) called ‘From Parts Unknown : Fight Like A Girl’. Co-written by Australia’s own Mandy Kane, the track is one part urban and two parts electro with a little bit of rock thrown in to add punch (pardon the pun). The video, also produced locally, features some of Australia’s premier female wrestlers going blow for blow in the ring, surrounded by flying sparks and flames. The soundtrack for the film is set for release “late this year”.